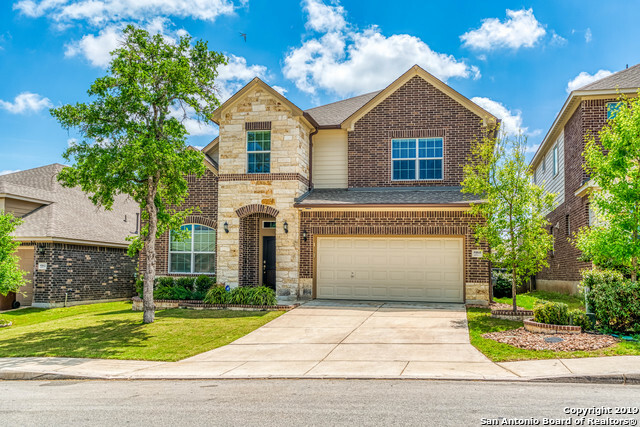 All TWO CREEKS homes currently listed for sale in San Antonio as of 04/26/2019 are shown below. You can change the search criteria at any time by pressing the 'Change Search' button below. "One Of A Kind David Weekley 4bed/4bath in desirable Two Creeks. 6 Months New!! Owner Relocating, Amazing Opportunity For New Owner. 9.5yr Structural Warranty. Still Under Full 1st-Year Warranty! Beautiful Distant Views from the Extended, Oversized Covered Patio. Call The Levi Rodgers Group Today For Details on This Fully Loaded Stunning Stucco Home. Interior Stone Archway. Well-appointed Master Suite. Huge Loft and Gameroom. Enjoy Two Creeks, Leon Springs, the Celebrity HEB and I10 access. " "You'll have an immediate sense of great style and contemporary design as soon as you step into this beautiful home. Ample countertop and cabinet space in the kitchen, with an over-sized island, stainless steel gas appliances, and beautiful granite is a chefs dream. The over-sized windows bring in natural light to the open kitchen, family, and dining area. The Master bedroom is located downstairs with a walk-in super shower that is a must see. Upstairs, the Jack-and-Jill bathroom is ideal." 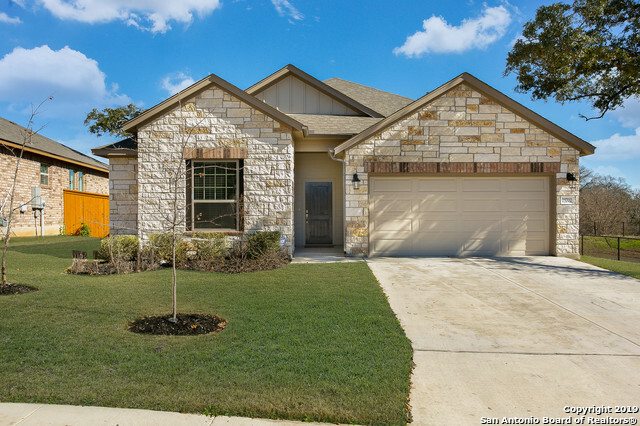 "This beautiful single story home provides a 3 bedroom, 2.5-bathroom floor plan with a large 3-car garage. The spacious study presents a versatile opportunity to create your ideal home office or reading lounge. Your open concept floor plan offers a sunlit interior design space that adapts to your everyday life and special occasion needs. Cook up culinary delights in the streamlined kitchen that features plenty of storage and prep space and a family breakfast island. Relax and enjoy your coffee on"
"OPEN HOUSE 4/20 12-3PM Energy efficient home on corner lot w oversized 3 car garage. Beautiful hardwood floors, double height cielings, iron railing staircase with open floor plan & entertainers kitchen w island cooking , granite counters, ss appliances , stone backsplash open to living room. Manicured landscaping w mature trees, complete sprinkler system and covered patio with extended porch/sitting area for entertaining. Single owner." "Perfection! 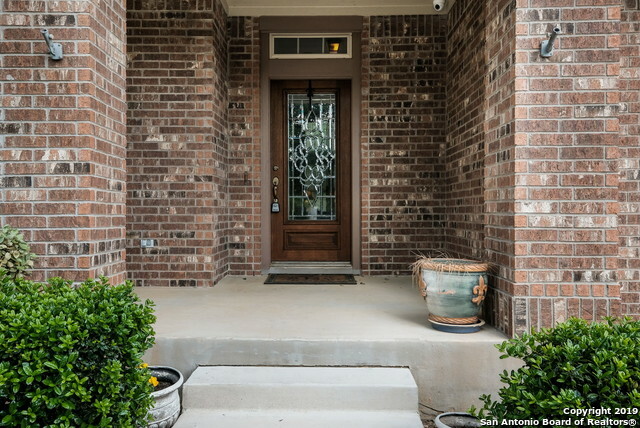 A beautiful covered porch entry greets you as you enter this immaculate one story open floor-plan home. Kitchen offers perfect space to entertain, chef grade appliances, granite counters, breakfast bar, & opens to family rm w/natural stone fireplace. Spacious master featuring bay window, jacuzzi tub, & rain shower. Wood flooring in all bedrooms. Modern light fixtures, mudroom off garage, Study/office w/stone wall. Private lush landscaped backyard, extended covered patio overlooking g"
"This is it! This STUNNING edifice is the home you have been dreaming of. It boasts of elevated ceilings, plenty of natural light, all the touches of luxury, and is located in an Exclusive community. It boasts of an alluring downstairs master equipped with built ins, and a grandiose walk-in closet. This dazzling kitchen and backyard (with covered patio) are PERFECT for entertaining! 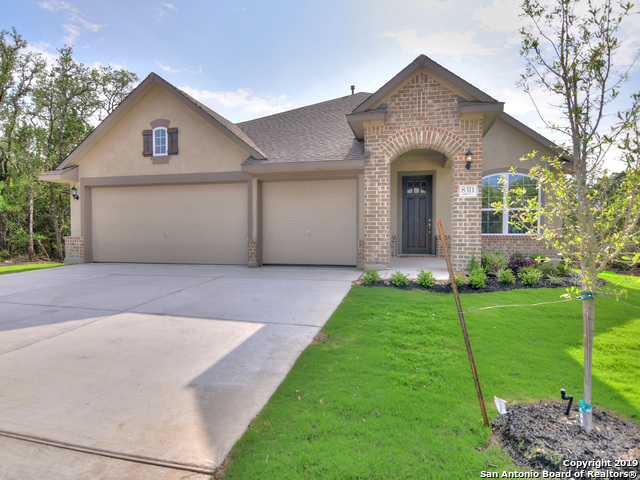 Gorgeous custom finishes like the garage and Study make this home an absolute must see! Seller to install NEW Roof"
"**Just reduced $5K! Bring your buyers, we are ready to sell***This previous model home has it all! Master retreat with sitting area and 2 closets; secondary bedroom near master is perfect for a nursery or office; family room with high ceilings, formal dining, eat in kitchen; custom built in hall tree in laundry; 3 car garage and huge bonus loft upstairs with walk in attic access; Easy access to IH-10, gated community and high-rated schools. Sellers are ready to hear your offers!" "Here's an opportunity to own an impecably well maintained single story,single level property with super open 3/2 floorplan*Tucked behind gated BLUFFS@TWO CREEKS-one might think it was just built-but the energy effecient DAVID WEEKLEY HOME has timeless charm*The office is large & could certainly be used as 4th bedroom,if needed*Huge granite kitchen island adds perfect serving space* Manicured landscaping*Need more? How@ fridge,washer & dryer CONVEY & enjoy relaxing views of greenbelt on great bac"
"Rare find in Two Creeks this gorgeous like new home features an open concept. Sliding doors from the living lead to an outdoor oasis. Greenbelt home site with an oversized patio with an abundant amount of space to entertain. The home features wood flooring, granite countertops, 42 cabinets & stainless steel appliances. This beautiful home will not last long schedule a showing today!" 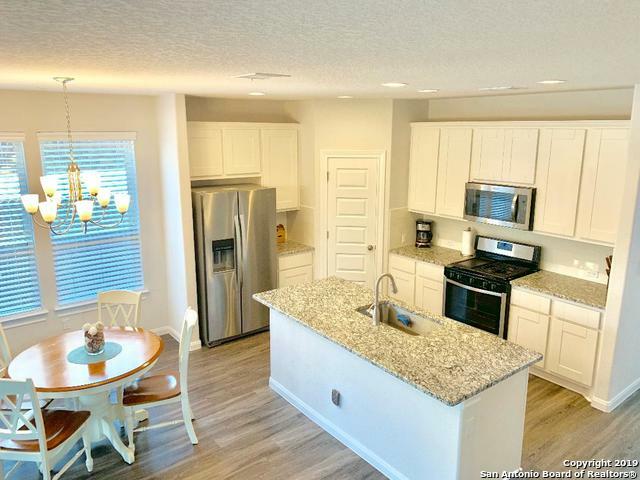 "Brand New Carpet in one story plus loft 4 bedrooms downstairs: gourmet island kitchen, ceramic tile, vaulted ceilings, granite countertops, coffered ceilings. 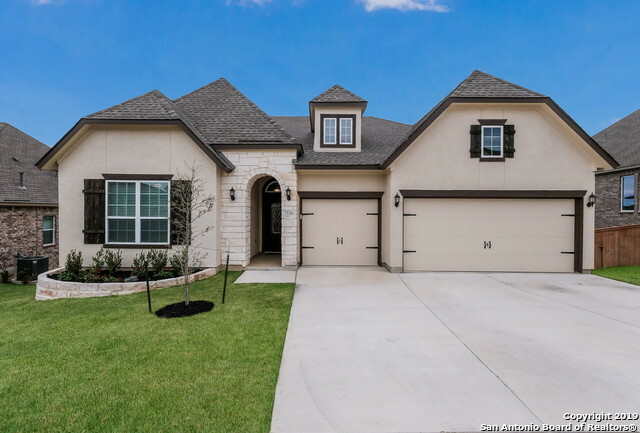 Laundry room with built in cabinets, large master suite with sitting area, 2,994 sq ft...Covered patio in backyard, great landscapingLocated Right off IH-10 Northside ISD schools including top-rated Aue Elementary right across the street. Gated neighborhood with community pool & clubhouse. 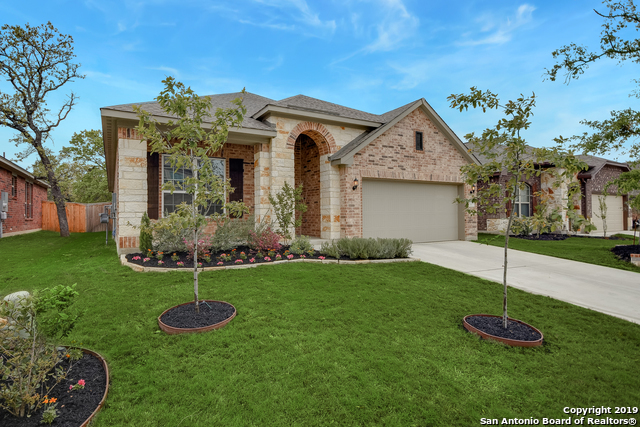 Just a short drive to La Cantera, The Rim Valero, "
"Beautifully appointed 1story with oversized 3car garage. Rich Pecan colored wood floors & High Ceilings welcome you home. French door Study off entry. Arched design entry to dining room. Open living area has a stone corner fireplace and view of LRG back deck. Breakfast room has Window w/deep seating/decor area. 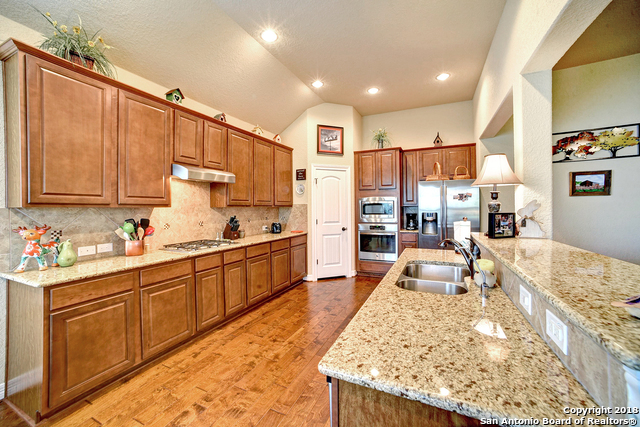 Spacious Kitchen with custom cabinets & granite counters. the Master bedroom has bay window seating area large walk in closet & dual vanity"
"Priced UNDER BCAD appraised value of $346,110! Come home to 4 spacious bedrooms, multiple walk in closets, home office, and HUGE loft/gameroom. Open concept living/dining area with oversized eat-in kitchen island. All appliances PLUS washer & dryer convey!! Covered patio that's perfect for entertaining! Neighborhood park with amenities for the family. Motivated Seller, ready to get this home under contract! Make an offer!!"